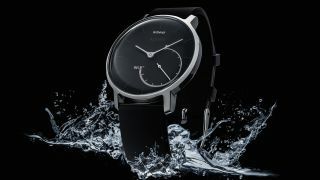 Withings, popular for its Activité watch line has unveiled a new connected wearable called the Activité Steel. Featuring a stainless steel case, chrome hands, silicone straps and a tachymeter-inspired sub-dial the Activité Steel is geared towards men's fashion but can also be seen as the more premium version of the Activité Pop watch. The timepiece counts your steps, sleep and swimming activities in real time and acts a silent alarm just like the previous Activités. The Steel's battery lasts up to eight months without a single charge. Activité Steel also features two hand dials, one showing the time and a sub-dial showing the percentage of your daily step goal achieved. The step goal is set within the free Withings Health Mate application (available on both iOS and Android platforms). It also automatically detects activities (such as running and swimming) and will transition to monitor sleep when worn at night. The device is water-resistant up to 50 meters. At just $169.95 (about £112, AU$240), it will initially be available in classic black and is exclusively sold from the Withings Store.